The Physical Standard Test & Physical Efficiency Test (PST/PET) for recruitment of 2564 posts of Constable (DEF-1438(UB)-SB-66(UB)+APRO-806+F&ES-114+SDRF-120 and 10 male & 10 female for Delhi Police pursuance to the advertisement published on 10-12-2015 will be held w.e.f. 23-02-2016. 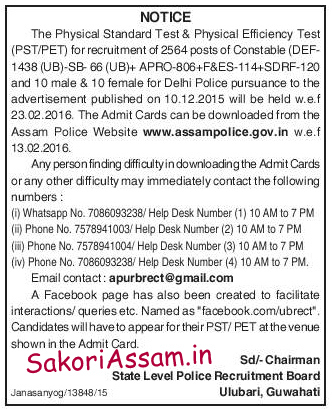 The Admit Cards can be downloaded from the Assam Police website www.assampolice.gov.in w.e.f 13.02.2016. For more information you can download the official notification from below.